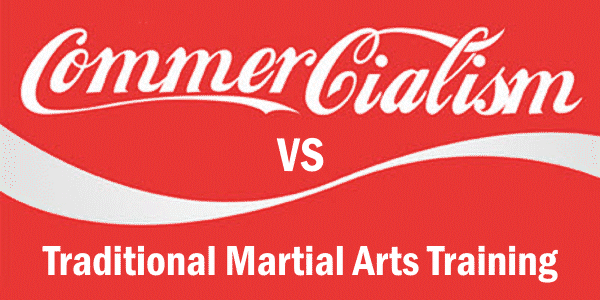 A plethora of articles have been written on the subject of traditional martial arts training versus commercialism over the past several decades; yet the debate continues. I’ve been assisting with the instruction of karate classes at a friends (David) school, along with another gentleman (Ariel) who has been training in Shotokan for more than 26 years. David has been running a commercial school for over twenty-five years. His original areas of study are Tae Kwon Do and Hapkido. Over the past decade he has been incorporating a variety of other styles like Kung Fu, Escrima, Krav Magra, and grappling to name a few. Since we’ve known each other he has continually ask me why I train in and teach kata. He has battled with what the curriculum of his classes should be, and why there is a lack of discipline among many of the students. He is a big fan and student of Bruce Lee, which may explain his lack of fondness for teaching forms and wanting to adhere more to self-defense/fighting tactics. 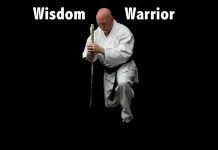 Those of you familiar with Mr. Lee’s direction of practice towards the latter years of his life know he felt practicing forms (kata) was a waste of time. Bruce felt training to fight in as realistic manner possible was the way to go. During a recent talk David told me he’d spent the weekend in Dallas with John Graden (founder of NAPMA, among other organizations) and other commercial school owners. They were all wrestling with the same dilemma; what to teach in order to retain students. Remember, they make a living based on the number of students they have. He told me he was thinking about changing his curriculum so it would reflect more realistic training for them in the street. In other words, he wants to focus on self-defense so a student will be able to defend themselves in the street sooner than traditionally trained karate students. He wasn’t planning on teaching any kata until they earned their black belt. At this point you may be experiencing the same reaction I had. How can a person become a black belt and not know a single form? That may also beg questions like; what is a black belt? Or, what does earning a black belt mean? The following day we were joined by Ariel. I ask David if he’d discussed this new direction he was contemplating with him. He hadn’t so he went over it with Ariel. David again got into the issue of why we learn katas. Why does a student turn one way when going the other direction might be better? 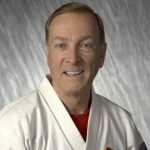 Why does one instructor teach Bunkai (explanation of movements and tactics within a kata) differently than another, or at all? The conversation continued thusly until we lined the students up to begin class. I tried to run a commercial school back in the 1970s in Indiana. I didn’t use contracts or advertise. I had over a dozen regular students, but never had the numbers that would have allowed me to not work a primary job during the day. I’ve never sacrificed my traditional methods of teaching or training in order to coddle students to keep them from loosing interest. I have endeavored to teach both proper technique and attitude since becoming a karate instructor in 1967. I know many of you can say the same. Therefore my question is simple. Why can’t many traditionalists run commercial karate schools without sacrificing quality in skills, techniques and attitudes? I can’t help but think there must be some instructors who are successful at teaching this way. Yet many others fail. When Ariel and I talked this over he suggested maybe many of these instructors weren’t taught how to properly understand what they were studying and why. Therefore they weren’t able to pass this along to their students. This makes sense to me and I’m sure to some of you readers. It also raises certain questions. What was the focus of your instructor’s classes? Did you work mostly on sparring in order to compete at tournaments and less on kata? Did you train any on self-defense? What about learning the various histories of some of the major styles from Okinawa, Japan, Korea, or China? Or the various types of training ancient worriers (Samurai) underwent in addition to fighting and strategy? Don’t know the answer to any of these questions? See what I mean? So what should be the goal of martial arts schools? What should instructors hope to achieve in training their students? Both of these questions will vary depending on whether said instructor hopes to make a living at teaching, or wishes to train dedicated and skillful students with proper attitudes and understandings of what they studied and why. For those teachers who want to both make a living and have dedicated students who really earn a meaningful black belt the challenge is clear. The difficulty lies in setting a straight course and sticking to it. When I first began my studies in the martial arts I had some instructors who taught some aspects of history and the essences of the particular art, and others who didn’t. Over the years I’ve learned much on my own. There was a time when I was very involved in competition (May of 1966 through April of 1988). It was more for the purpose of showing my students I was capable of practicing what I preached. It was also a means for me to find my weaknesses and work towards improving my skills and knowledge. I hope my friend David finds what he’s looking for. He does a great deal of reading and study in the arts, which has increased his knowledge and understanding. He must decide on a single curriculum and stick to it. Over the seven or eight years I’ve know him he’s continually battled with what to teach. What should he expect from his students? In the early years of teaching he taught disciplined traditional Korean style classes. He had a number of very good and dedicated students. He wants to capture that again, but appears to be more focused on economics than the traditional aspects of his school. Is he dealing with a dilemma? Of course he is. He was trained in a traditional manner. Over the years he’s become more enamored with success stories of commercial school owners who’ve become millionaires. He’s striving to find the nitch that will give him the same success. Whether he will realize his financial dreams in South Texas or not, only time will tell. Time will also reveal whether he is successful at both training dedicated students and keeping a high enrollment, or turning out black belts who lack the traditional qualities and haven’t really earned the rank. During a discussion with Ariel he recounted how when starting as a white belt at his University in the Philippines there were some 500 others. More than 5 years later when he tested for his black belt there were only 7 of the original class. Over my forty-eight years of involvement in the martial arts I’ve seen countless numbers of students come and go. Yet those who stuck it out to eventually earn their black belt were few. Those who continued on to higher black belt ranks were fewer still. It didn’t make much of a difference whether the instructor tried to make the classes interesting or just stuck to the traditional ways of training. There will always be those who have it in their heart to become a dedicated practitioners. This dedication will take them through a life time worth of training and learning. The true martial artist is less interested in rank than he is in growing in his respective art. There are many others who start their training with the sole goal of earning rank. It’s more an ego trip for them. The desire to learn is present only in so far as it facilitates their progression in rank, not because they truly want to learn. 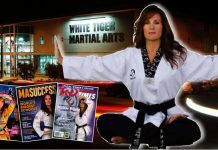 These want-a-be black belts are facilitated by money minded instructors. For me there is but one question. Do I continue to train students based on the traditional ways I learned? Or do I sacrifice some of the disciplined traditionalism in order to increase the number of students on the floor? If you know me you know the answer already. For those readers who don’t it’s simple. I would rather have a few hard working dedicated students who are truly interested in learning, rather than students who want to know how soon they could earn their black belt. Their desire should be the experience of learning and growing in both their knowledge and skills. Not rank. If it’s a black belt they want the store down the street sells them for $7.95. If I ever get to the point where money is more important than my traditionalistic principles, it will be time for me to hang up my belt. 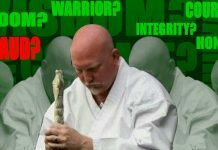 Respectfully Yours in Budo.